``There are four modes of gameplay. One-player, which pits the player in a solo match against a computer opponent. Two-player, which is a co-op match against a computer opponent. Versus, which is a two player mode that pits the players against each other. And finally, Watch, which oddly enough, allows the player to watch a computer-controlled match. The court is displayed in a vertical fashion, from a top-down perspective, revealing only half of the court at a time. If the ball travels past the half-court line, the screen goes black temporarily and changes over to the other half of the court (which looks identical, save for the color of the floorboards). This is done to alert the player that they have travelled to a different side of the court. When a player attempts a slam dunk, gameplay will pause and cut to a detailed animation of the maneuver. 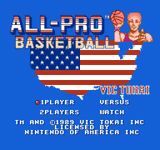 Source: Wikipedia, "All-Pro Basketball", available under the CC-BY-SA License.